To the Dyfi Osprey Project today. There has been a small nature reserve here for some time before the ospreys arrived and made it famous. Not far away is the larger RSPB reserve at Ynys Hir. But it was not there that the ospreys chose to nest but in this wetland reserve run by the Montgomeryshire Wildlife Trust. From the entrance a boardwalk traverses the wet ground where bog myrtle, cotton grass, yellow flag iris and ragged robin grow in and around the boggy pools. Among the high-growing reeds there are bittern according to the information board. I’d love to see - or even hear -one. No such luck, though a sedge warbler rises and then descends in a ripple of song. Beyond the reserve, along a water course, I spot a heron and follow it through binoculars as it drops out of sight into rushes. The boardwalk arrives at a large wooden structure built with lottery money to provide an observation point for the osprey nest. The viewing area looks directly towards it on a flat platform on what looks like an old telegraph pole. The nest appears to made mainly of driftwood from the estuary, at least from the outside. The head of the female sitting on her eggs can just be seen. We are told the male is just out of sight on a fence post below. We wait. A dozen or so people stand around the viewing room, some exchanging bird notes and occasionally checking the nest through one of the telescopes trained on it. Then a sudden burst of activity! The male appears: binoculars are up, cameras are clicking behind tele-photo lenses. The bird disappears for a while behind trees, then flies back towards the nest, changing places with the female who glides away towards the river. For food? Apparently not. She returns with a large twig for the nest and the male moves out and drops down to his perch out of sight behind the trees. Drama over. The flurry of activity subsides in the viewing room and gallery. We withdraw, lingering along the boardwalk to watch a pair of water buffalo that have been brought in to graze the wet meadow at the top of the reserve. You can watch the activity at the nest live on a webcam HERE. 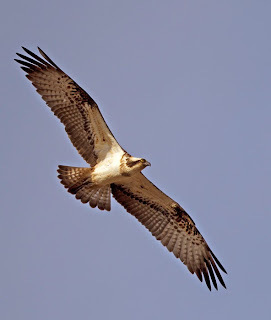 But there is no substitute for going there, not just to see the ospreys but to spend time in the wetland habitat that attracted them. They have been given names, but I prefer not to appropriate their identity in that way. They are wild creatures in a wild place and there are sufficient ironies in the structures we build to make such places accessible without adding to them unnecessarily. Wonderful photo, did you take it? No I don't have a good enough camera. It's a library photo of a Dyfi osprey.